Beginning/Intermediate. Contains much variety; rock, modal, and swing. 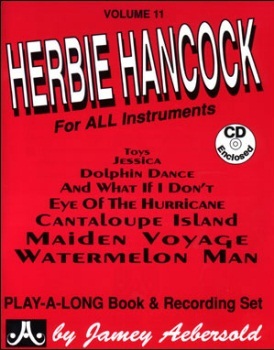 8 songs written by Herbie Hancock that range from the funky "Watermelon Man" to the modal "Maiden Voyage." Beginners will find tunes containing only 3 or 4 chords at relaxed tempos. Intermediate players will enjoy a variety of styles to choose from and advanced players can get into unusual changes and faster tempos. This, like Volumes 5, 17, 54, and 70, is another great "transitional" set to take you from learning scales and chords to actually improvising on real jazz standards.